Concerns about depletion of fossil fuels and energy security have increased interest in renewable energy sources. Biogas, generated from anaerobic digestion of organic wastes, has a relatively low cost and is considered to be a renewable energy carrier. There is an increasing interest in converting biogas to "green" transportation fuels. This fact sheet discusses the technologies that are currently available or still under development for converting biogas to transportation fuels. Compressed natural gas (CNG) is an alternative fuel to conventional transportation fuels, and is known for its low greenhouse gas emissions . CNG produced from biogas, named as Bio-CNG, is similar to regular CNG in terms of vehicle fuel economy and emissions. 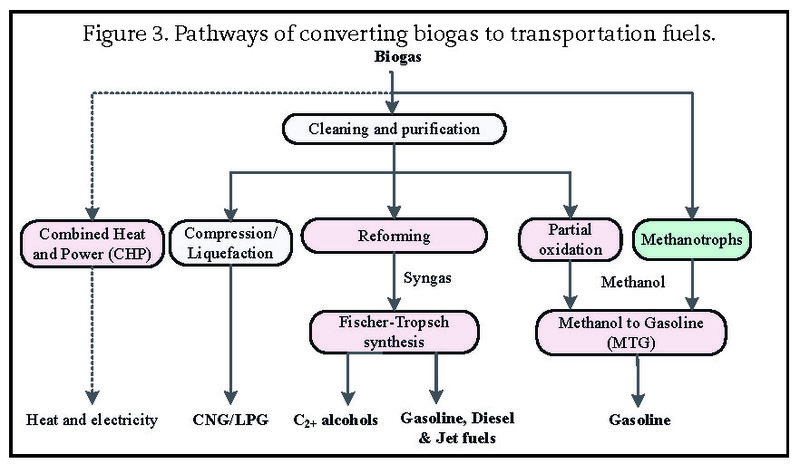 Conversion of biogas to Bio-CNG requires removal of impurities such as water, N2, O2, H2S, NH3 and CO2 from raw biogas. Bio-CNG is then made by compressing the purified biogas (>97% CH4, <2% O2) at a pressure of 3000–3600 psi (20–25 MPa). Bio-CNG requires less than 1% of the volume that it occupies at standard atmospheric pressure. A typical CNG/Bio-CNG station (Fig. 1) is composed of a biogas purification unit, a multi-stage compressor and a high-pressure storage system . There are two commonly used storage systems: buffer storage system and cascade storage system. The buffer storage system maintains CNG pressure in the range of 20–25 MPa and provides CNG with a maximum pressure of 20 MPa to on-board vehicle cylinders. The cascade storage system typically consists of three reservoirs with low, medium and high pressure, respectively; accordingly, CNG is filled to on-board cylinders via three steps from low pressure to high pressure. Compared to the buffer storage system, the cascade system consumes about 50% less energy, but charges 20% less biogas and requires three times longer filling time. Therefore, cascade system is preferred for fleet time filling, which usually takes hours. Figure 1. Bio-CNG gas station. LBG is similar, if not identical, to liquid natural gas (LNG) with respect to methane content and heating value. LBG is a valuable product as it is more than 600 times space efficient compared to biogas at atmospheric pressure, or around 3 times more space efficient compared to Bio-CNG. Therefore, converting biogas to LBG facilitates transporting biogas produced in remote areas to where it is needed. To produce LBG, biogas needs to be upgraded to contain less than 25 ppm CO2, 4 ppm H2S and 1 ppm H2O, and then undergoes a liquefaction process that converts the upgraded biomethane to LBG at -196°C to -161°C. This process requires high energy inputs. Currently, there are three methods commonly used for LBG production, including cryogenic process (Fig. 2), liquefaction and pressure letdown . The cryogenic process is the most commonly adopted process, which takes advantage of the different condensation temperatures of gases to purify biogas and consequently obtain LBG (Fig. 2). Water and water-soluble organic compounds are separated from biogas at around 6°C down to -25°C; H2S is converted to element sulphur and then is filtered; CO2 is removed by lowering temperature to -78°C. Temperature is further decreased to -190°C so that CH4 is condensed into LBG. This method does not require any chemicals but provides high purity liquid CO2 as a by-product. Chemical and biological pathways can be used to convert cleaned biogas (primarily containing CH4 and CO2) into methanol, ethanol, diesel, liquefied petroleum gas (LPG) and gasoline (Fig. 3). For methanol production, partial oxidation of methane (Eq. 1) is a method that has been developed and widely used since first reported in 1923. This chemical conversion process is usually carried out at high pressures of 0.5–15 MPa . Biological conversion of methane to methanol, in which methanotrophic bacteria are often employed for methanol production, is currently at the research stage. Methanotrophic bacteria contain a special enzyme, named methane monooxygenase (MMO), which enables them to use methane as their only carbon source for metabolism under ambient conditions . Methanol can also be produced after reforming methane to syngas followed by catalytically converting syngas to methanol as shown in Eqs. 2 and 3 . Produced methanol can be further converted to gasoline via an MTG (methanol-to-gasoline) process. Syngas, which is an important starting material for creating other fuels, can be generated from biogas/biomethane via three main reforming processes . Dry reforming and steam reforming can use cleaned biogas to produce syngas (Eqs. 4–6), while POR oxidizes methane to syngas (Eq. 7). Dry reforming and steam reforming are highly endothermic reactions and typically take place at 700–900°C. Steam reforming is often followed by a water shift reaction to enhance H2 production (Eq. 6). POR is an exothermic reaction; therefore, it can be combined with either dry reforming or stream reforming to reduce energy inputs (Eq. 7). The combination of steam reforming and POR is recognized as autothermal reforming (ATR). Besides being converted to methanol, syngas can be used for the production of a variety of other products (e.g., LPG, diesel, jet fuels) via the Fischer-Tropsch (FT) process (Eqs. 8–9). Syngas can also be converted to ethanol via chemical methods such as the FT process, while related biological methods are currently being researched, with extensive interest in genetically engineered microorganisms. Conversion of biogas to transportation fuels provides an alternative to fossil fuels and has the potential to partially satisfy growing energy demands. It will also promote the development of anaerobic digestion systems, which is an environmentally friendly waste management technology. Biogas-derived transportation fuels also have the merits of generating fewer greenhouse gases and particulate matter compared to traditional fossil fuels. Bordelanne O., Montero M., Bravin F., Prieur-Vernat A., Oliveti-Selmi O., Pierre H., Paradopoulo, M. and Muller, T. 2011. Biomethane CNG hybrid: A reduction by more than 80% of the greenhouse gases emissions compared to gasoline. J. Nat. Gas Sci. Eng. 3:617–624. Farzaneh-Gord M., Deymi-Dashtebayaz M., and Rahbari HR. 2011. Studying effects of storage types on performance of CNG filling stations. J. Nat. Gas Sci. Eng. 3:334–340. Johansson N. 2008. Production of liquid biogas, LBG, with cryogenic and conventional upgrading technology. Master thesis. Lund Institute of Technology. Lau CS., Tsolakis A., and Wyszynski ML. 2011. Biogas upgrade to syn-gas (H-2-CO) via dry and oxidative reforming. Int. J. Hydrogen Energ. 36:397–404. Park D. and Lee J. 2013. Biological conversion of methane to methanol. Korean J. Chem. Eng. 30:977–987. Ma Y., Ge Q., Li W., and Xu H. 2008. A sulfur-tolerant Pd/CeO2 catalyst for methanol synthesis from syngas. J. Natural Gas Chem. 17:387–390. Serrano-Lotina A. and Daza L. 2013. Inﬂuence of the operating parameters over dry reforming of methane to syngas. Int. J. Green Energy. 1–6.